As an AMC history buff I have finally decided to find all of the former AMC dealerships in the Cleveland/Akron area. Last weekend Marlene, the kids and I struck out with a camera to photograph what these dealerships look like now. If a project like this interests you why not take a day to document some of these former AMC "shrines" in your area. You never know what you may find! Don't think I've got any picutres of the dealership in my home town. It's gone now, the roof fell in years ago. I do remember seeing the sales awards for Hudson and Nash from 1940 and '46 hanging on the wall! They had 3 junkyards in town and even those have been smoothed over. They really pushed the sales of performance AMC's early on. One brother told me that the only hi-po AMCs that they never sold new were the SC/Rambler and SS/AMX. And he did sell a used SC car. That all came to an end after several accidents resulted in a couple of locals getting killed in what the police refered to as "those souped-up Nashes"
Researching the local dealers is something I would like to do, too. I have gone so far as to track down the previous owner of the nearest ex-AMC dealership. He now owns dealerships in Seaside and Monterey. His ex-service manager said he has a pile of photos of the old dealership with Gremlins and Hornets out on the lot. Gotta git er done.....soon I hope. I'm not sure what zone this was, I'll have to look that up! Kammback, I am photographing all of the locations even if the building is no longer there. One of the FIVE different AMC dealerships that I know about here in town is now a public parking lot. 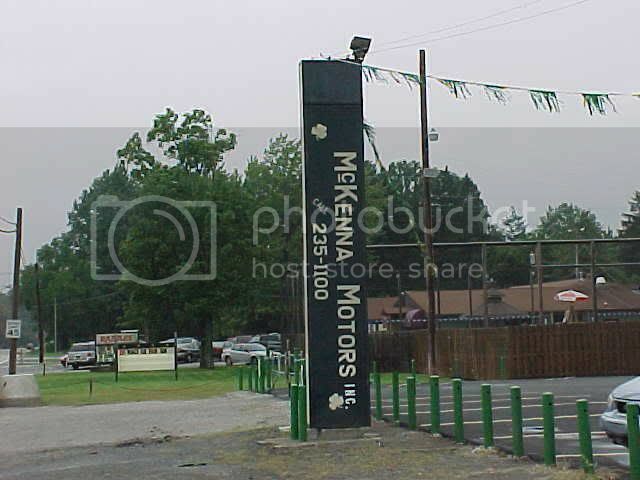 That happens to be the place where I bought my first car back in 1980. That vertical sign would be a score. It's likely someone just slapped some paint over the American Motors lettering and logo. With some care, the paint could likely be stripped off to reveal the original sign. My home town dealer pulled down the signs from the building and hauled them to his junkyard... where I picked them up and took them home, 20 years ago! I stashed them away and almost forgot that I had them until last summer. Looks good up on the wall! I can take some pix of former local dealers. I know where there are about 5 or 10 that still exist. Well, the original buildings do (in their original form) but they are used for other purposes now. I was thinking I would do that a few years back mut I never got around to taking the pix..